Vegan Macro Bowl With Lemon Garlic Creme is packed with nutrients.Yum. Macro Bowl With Lemon Garlic Creme. At the risk of completely repeating myself every time I post a recipe for a macro bowl, I like to explain the wonders of macro bowls. 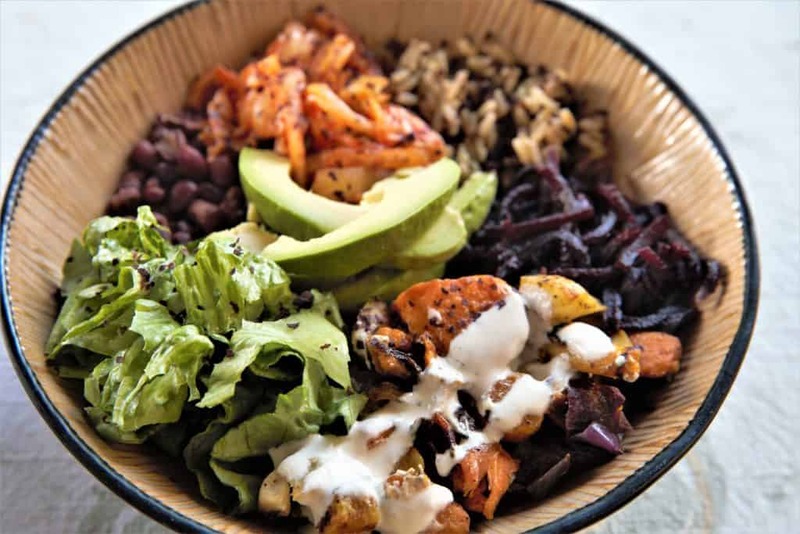 A macrobiotic bowl features grains, fermented food, and sea vegetables. I have created other recipes for macro bowls, as they are perfect dishes to experiment with different combinations. 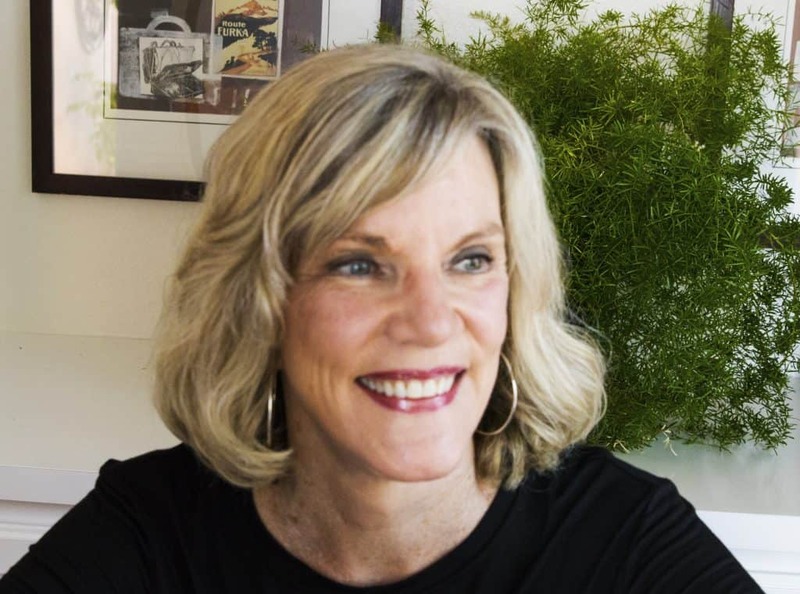 What is macrobiotic, and why do I want to eat that way? 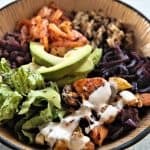 Generally speaking a macrobiotic diet involves eating primarily a plant based diet and combination of nutrients to obtain a yin-yang energy balance in the body. I love these bowls, and definitely feel better after I eat one. You can mix it up according to your preferences, but this bowl includes some yummy choices. This dish is vegan, gluten free and dairy free. 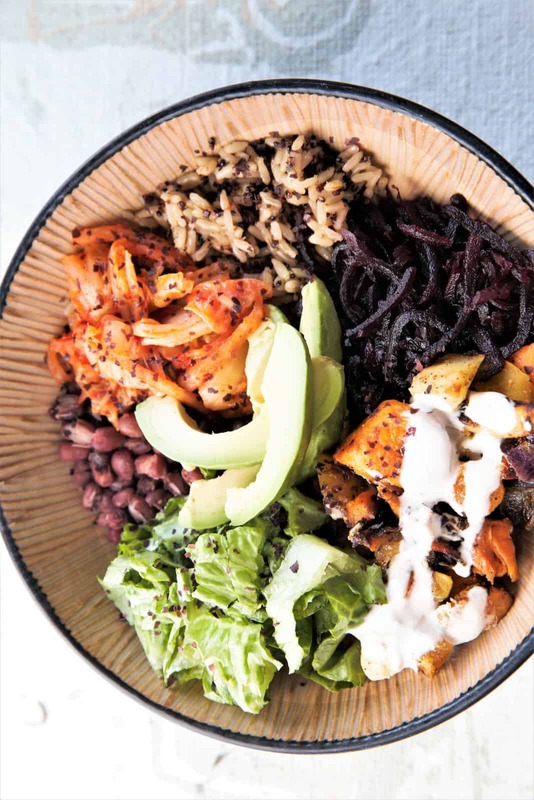 Macro Bowls are life, and this energizing bowl contains it all. Vegan, gluten free, dairy free. Heat these ingredients in the microwave for 2 minutes. I add lettuce and avocado after heating. If you have not prepared your beets or roasted vegetables, the recipe will take an additional 45 minutes, but so worth it.